1976 Plate Run - Mike Sells (my partner in all of this) brings to you everything from 1976. Check it out! 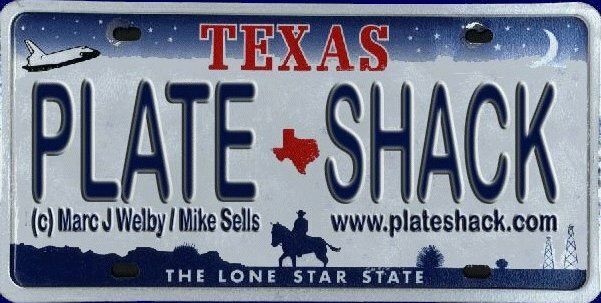 Y2K Page - Mike also brings you the plates of 2000 and beyond, hosted right here at the Plateshack. Submissions are always welcome. Sign or View the Guestbook: I'd love to see your feedback, comments or questions about the site. Links - Here's the rest of what's out there in License Plate Land. If you see a site not listed, please let me know. Unless noted, the images either belong to Marc Welby or Mike Sells (ALPCA 6464). If you want to use an image, please ask first, chances are I'll say yes. This page was originally launched on 2/15/97 in Baton Rouge, Louisiana, and is now maintained in Fort Worth, TX.